Greene's guitar credentials are undisputable throughout, making this a delight for the fan, peer, or the next aspiring fret star. Two short examples apply: the simple earthy electric blues shred at the start on Before the Storm, and the fine acoustic work of Dearly Departed. 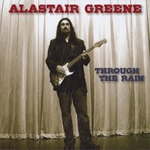 With Through the Rain, Alastair Greene applies his daredevil blues guitar work to his hard rock influences. The result is some blistering rock, with fiery fret work.